Dress up your windows with decorative curtain rods and hardware that will suit your style, room and budget, from Designer Drapery Hardware. 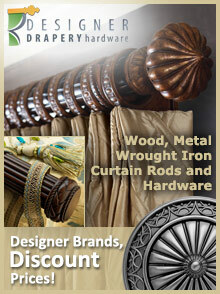 Enter the coupon code - CATDDH - at checkout on the Designer Drapery Hardware website. Curtain Rods - Have a brand new set of curtains you can't wait to hang? Don't settle for any old ordinary rod until you've explored the fine collection of decorative curtain rods and drapery rods from Kirsch. You'll find everything from superfine traverse to empire traverse rods, lock seam, utility and valance rods, sash, spring, cafe and continental styles, plus special purpose options that are ideal for tricky bay window, arch and corner curtain placement. Browse coordinating curtain rod hardware and accessories including hooks, tiebacks and nite holders available in your color of choice. Shop by Brand - Shop popular drapery hardware specifically by brand with only the cream of the crop in curtain rod hardware suppliers in stock. Trust your window treatment accessory super source to help you discover all of the leading names in the industry including Kirsch Drapery Hardware, Gould NY, Paris Texas, Dakota, Brentley, Finial Co., House Parts and Select, with exclusive access to the best brands featured all under one roof. Shop by Type - Whether you're on the hunt for holdbacks or anxious to find finials, Designer Drapery Hardware makes it easy to find everything you need to install, hang and accent your draperies with ease. Explore hundreds of drapery and curtain rod finials, rings and brackets in every color and style imaginable. From connector screws and metal clips to supports, wands and batons, you'll find pole treatments and accessories to fit all of the popular sizes, with options that cover every price point. Shop by Styles - Unleash your inner interior designer while transforming your rooms with window treatment styles that reflect your fine taste. From earthy and sturdy wood drapery rods and accents to industrial metal and wrought iron options, whether you prefer simple or ornate, you'll have access to an extensive selection of styles to choose from. Not sure where to start? Check out their easy to use Virtual Designer feature that will automatically calculate everything you need to install your dream window treatment with a few simple clicks. Shop with confidence from your new home for decorative drapery hardware, featuring the best brands, the best selection, and the best prices to fit your next home improvement project.